The Yankees play the Phillies tonight in Game 6 of the World Series. Every time A-Rod hits a home, patrons recieve a free A-bomb drink on the house, courtesy of T.G. Whitney’s. 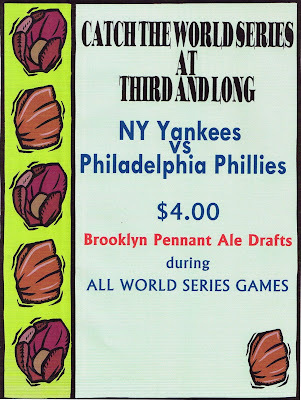 Game time specials at Chelsea Brewing Co. The Banshee Pub & Trinity Pub do not serve food, so they are bringing it in. Free pizza during the games, and a free shot for every Yankee home run. Free shots at each Yankees Home Run for those in Yankees jersey or hat. And OK, Phillies phans, we’ll throw you a phrickin’ bone.